What Happened to You Lazy Lou? A week before Christmas in 1944 and within minutes of take off from their base in England, two american aircraft collided in a tragic unnecessary accident, killing well decorated combat veterans and mortally wounding a beloved mascot. CBI - China: Day 139 of 154 of the Japanese Invasion of Manchuria. CBI - China: Day 9 of 10 of the Battle of Harbin, Manchuria. CBI - China: Day 7 of 41 of the 1st Battle of Shanghai. Germany: Chancellor Adolf Hitler tells his top generals of his determination to conquer land to the east. CBI - China: Day 34 of 142 of the 1st Battle of Hebei. Spain: Day 202 of 985 of the Spanish Civil War. Spain: Day 567 of 985 of the Spanish Civil War. CBI - China: Day 212 of 2,987 of the 2nd Sino-Japanese War. Spain: Day 932 of 985 of the Spanish Civil War. CBI - China: Day 577 of 2,987 of the 2nd Sino-Japanese War. Finland: Day 66 of 105 of the Russo-Finnish War. CBI - China: Day 942 of 2,987 of the 2nd Sino-Japanese War. Day 81 of 381 of the Battle of South Guangxi. Day 7 of 67 of the Battle of Wuyuan. ETO - UK: Day 151 of 258 of the Blitz. MTO - North Africa: Day 57 of 63 of the UK's Operation COMPASS, their campaign in North Africa against the Italians in Egypt and Libya. MTO - Albania: 33 Italian Fascist Party leaders are dispatched to bolster morale on the Albanian front. East Africa: Day 239 of 537 of Italy's East African campaign in the lands south of Egypt. The British Northern Force bumps into the Italian defenses at Keren, Eritrea, but fails to crack them open. General Platt decides he must build up his forces for a major assault. CBI - China: Day 1,308 of 2,987 of the 2nd Sino-Japanese War. Day 5 of 31 of the Battle of South Henan. CBI - Thailand: Day 126 of 221 of the Franco-Thai War (Vichy France vs Thailand). Atlantic: Day 21 of 169 of Germany's Second "Happy Time," during which U-boats sink 609 Allied ships with little risk. Russian Front - North: Day 149 of 872 of the Siege of Leningrad. Russian Front - North: Day 26 of 29 of the Battle of Toropets, Russia. A failed attempt to break the siege at Leningrad. Russian Front - North: Day 12 of 103 of the Battle of the Kholm Pocket. Another attempt to break the siege at Leningrad. Russian Front - Center: Day 27 of 103 of the Battle of Vyazma, Russia. Germans launch a counterattack cutting off and encircling several Soviet Army divisions. Russian Front - Center: Day 27 of 103 of the Battle of Sychevsk, Russia. Russian Front - South: Day 97 of 248 of the Siege of Sevastopol, Crimean Peninsula. All German attacks against Sevastopol are stopped for the winter. CBI - Burma: Day 52 of 164 of Japan's Invasion of Burma. CBI - China: Day 1,673 of 2,987 of the 2nd Sino-Japanese War. Day 42 of 99 of the 3rd Battle of Changsha. CBI - Java: Day 5 of 17 of the Battle of Singapore. The Japanese siege of British troops in Singapore continues. PTO - Borneo: Day 50 of 107 of the Battle of Borneo. US 5th Air Force B-17s attack shipping at Balikpapan. PTO - Dutch East Indies: Day 5 of 5 of the Battle of Ambon, resulting in a quick Japanese victory. PTO - New Guinea: The Japanese Air Force attacks Port Moresby. PTO - New Guinea: Day 12 of 18 of the Battle of Rabaul, New Britain Island. PTO - Philippines: Day 58 of 152 of the 1st Battle of the Philippines. 5th Air Force provides air support. President Roosevelt turns down a proposal from Philippines' President Quezon to grant his country total independence so it could declare itself neutral. ETO: America's future top scoring fighter Ace "Gabby" Gabreski, flying with RAF 315 Squadron, encounters his first aerial combat against the Luftwaffe, but flies too excitedly to make a kill. Russian Front - North: Day 514 of 872 of the Siege of Leningrad. Russian Front - North: Day 275 of 658 of the Siege of the Kholm Pocket, USSR lays siege to the Kholm Pocket but the Germans hold out for a about a year and a half. Russian Front - South: Day 54 of 69 of the USSR's Operation LITTLE SATURN. A successful drive into the Northern Caucasus and the Donets Basin pushing the Axis troops out. MTO - Italy: US 9th Air Force B-24s hit the harbors at Palermo and Messina. MTO - Tunisia: Day 79 of 178 of the Battle of Tunisia. RAF and US Air Forces provide Allied air support. CBI - Burma: Day 45 of 104 of the 1st Battle of Arakan. US 10th Air Force provides air support. CBI - China: Day 2,038 of 2,987 of the 2nd Sino-Japanese War. PTO - Alaska: Day 242 of 435 of the Battle of Kiska, Aleutian Islands. PTO - Malaya: Day 350 of 357 of the Battle of Timor Island, a long guerrilla war ending in Japanese victory. Allies continue evacuating off the island. PTO - Solomon Islands: Day 181 of 187 of the Battle of Guadalcanal. US 13th Air Force provides air support. ETO - Germany: US 8th Air Force B-17s and B-24s bomb the port area at Wilhelmshaven while others hit at Emden and Oldenburg. ETO - France: US 9th Air Force B-26s bomb V-weapon sites on the west coast of France. Russian Front - North: Day 640 of 658 of the Siege of the Kholm Pocket. USSR lays siege to the Kholm Pocket but the Germans hold out for a about a year and a half. Russian Front - North: Day 21 of 48 of the Battle toward the Narva River, Estonia. This drive helped lift the Leningrad siege and goes on to liberate Narva. Russian Front - North: Day 2 of 191 of the Battle of the Narva Isthmus, Estonia. Russian Front - North: Day 21 of 33 of the Battle of Luga, Russia. Taking this town west of Leningrad will open the door toward Estonia. Russian Front - South: Day 42 of 113 of the USSR's Dnieper-Carpathian Offensive in southwestern Ukraine. Russian Front - South: Day 5 of 31 of the Battle of Nikopol, Ukraine. Russian Front - South: Day 11 of 25 of the Battle of the Korsun Bulge in Ukraine. Russian Front - South: Day 8 of 16 of the Battles of Rovno and Lutsk, Ukraine. This Soviet victory will increase the gap in the German line from 70 to 110 miles wide. MTO - Italy: Day 18 of 123 of the Battle of Monte Cassino. RAF and US Air Forces provides air support for the Allied ground troops. MTO - Italy: Day 13 of 136 of the Battle of Anzio. An Allied attempt to break out of the Anzio Beachhead ends after an advance of just three miles in three days. The Germans begin their first counterattacks against Anzio. RAF and US Air Forces provides air support for the Allied ground troops. CBI - Burma: Day 36 of 99 of the 2nd Battle of Arakan. CBI - Burma: The Japanese open their counter-offensive against the British forces in Arakan. The 10th Air Force provides Allied air support. CBI - China: Day 2,403 of 2,987 of the 2nd Sino-Japanese War. PTO - Marshall Islands: Day 4 of 8 of the Battle of Kwajalein. US 7th Air Force provides air support. PTO - New Guinea: Day 138 of 219 of the Battle of Shaggy Ridge. 5th Air Force provides air support. PTO - New Guinea: Day 135 of 162 of the Battle of the Huon Peninsula. 5th Air Force provides air support. PTO - New Guinea: Day 51 of 597 of the Battle of New Britain. US 13th Air Force provides air support. PTO - Solomon Islands: Day 95 of 295 of the Battle of the Bougainville Islands. US 13th Air Force provides air support. MTO: Roosevelt, Churchill and Stalin meet in the Crimea at Yalta for the second of three wartime conferences to discuss Europe's post-war reorganization. Decisions made there will become a subject of intense controversy as the Cold War emerges, many calling it a "sellout" to the Soviets. The Yalta Conference, sometimes called the Crimea Conference and code-named the Argonaut Conference, was held February 4-11, 1945, to discuss Europe's post-war reorganization. Stalin was in the strongest position, as his Soviet troops were a mere forty miles from Berlin. 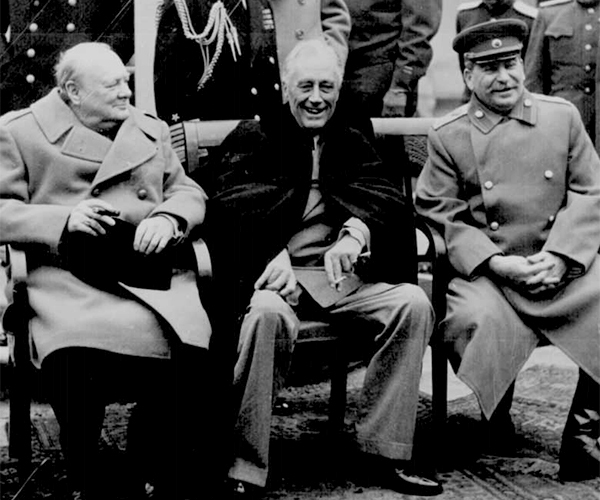 Yalta was the second of three wartime conferences among the Big Three. It had been preceded by the Tehran Conference in 1943, and was followed by the Potsdam Conference in July 1945. Churchill's attitude toward the Soviet Union differed vastly from that of Roosevelt, with the former believing Stalin to be a "devil-like" tyrant leading a vile system. All three leaders ratified previous agreements about the post-war occupation zones for Germany: three zones of occupation, one for each of the three principal Allies: The Soviet Union, the United Kingdom, and the United States. They also agreed to give France a zone of occupation, carved out of the US and the UK zones. Note: Roosevelt, looking quite frail here, will be dead of a massive cerebral hemorrhage in 68 days. ETO - France: Day 187 of 284 of the Battle of Brittany. ETO - France: Day 142 of 236 of the Siege of Dunkirk. ETO - Germany: Day 138 of 145 of the Battle of Hürtgen Forest. ETO: Day 15 of 66 of the Battle to the Rhine. US 9th Air Force provides air support. ETO - Germany: US 8th Air Force B-17s and B-24s carry out the heaviest attack to date against Berlin, killing more than 25,000 civilians. Russian Front - Finland: Day 142 of 223 of the Lapland War. Finland and Russia have joined forces to kick the Germans out of Finland's most northern province. Russian Front - Center: Day 112 of 206 of the Battle of the Courland Pocket in Latvia. Russian Front - Center: Day 10 of 75 of the Battle of Königsberg, East Prussia (now Kaliningrad, Russia). Russian Front - Center: Day 8 of 17 of the Battle of Rastenburg, East Prussia. The Soviets capture Landsberg, 80 miles northeast of Berlin. Russian Front - Center: Day 9 of 63 of the Battle of the Heiligenbeil Pocket in East Prussia. Russian Front - Center: Day 23 of 23 of the Battle along the Vistula and Oder Rivers in central Poland and eastern Germany. Soviet troops cross the Oder River into Germany. Russian Front - Center: Day 3 of 31 of the Battle of Schwedt, Germany. Russian Front - Center: Day 21 of 21 of the Battle of Warsaw, Poland. Warsaw falls to the Soviets and Polish troops. Russian Front - South: Day 98 of 108 of the Battle of Budapest, Hungary. Soviet troops have Budapest under siege. CBI - Burma: Day 16 of 61 of the Battles of Meiktila and Mandalay. The US 10th Air Force provides air support. CBI - Burma: Day 14 of 39 of the Battle of Ramree Island. The US 10th Air Force provides air support. CBI - China: Day 2,769 of 2,987 of the 2nd Sino-Japanese War. PTO - Japan: US 7th Air Force bombs at Iwo Jima and targets on Chichi Jima Island in the Bonin Islands. PTO - New Guinea: Day 404 of 597 of the Battle of New Britain. PTO - New Guinea: Day 288 of 481 of the Battle of Western New Guinea. PTO - Philippines: Day 107 of 299 of the 2nd Battle of the Philippines, aka the Liberation of the Philippines or the Philippines Campaign. PTO - Philippines: Day 51 of 244 of the Battle of Luzon. 5th Air Force provides air support. PTO - Philippines: Day 4 of 22 of the Battle of the Bataan Peninsula. 5th Air Force provides air support. PTO - Philippines: Day 1 of 29 of the Battle of Manila. US 6th Army begins an offense on the Japanese in Manila.